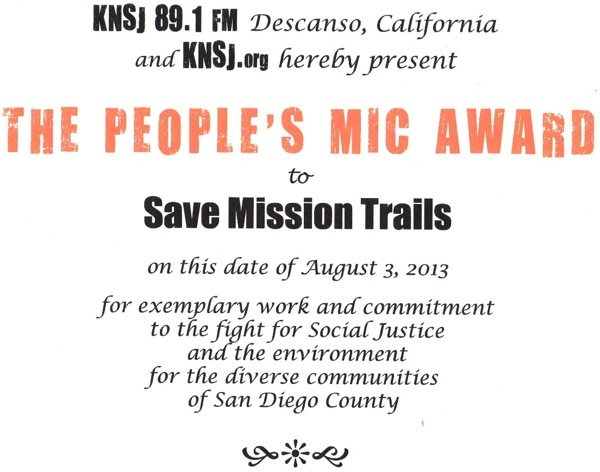 Save Mission Trails was honored with the People’s Mic Award on Saturday, August 3, 2013, at the Mission Trails Regional Park Visitor Center. YOU earned this award for your determination and resilience. Every letter written, sign waved, rally attended, comment spoken, and seat taken contributed to the CPUC denial of the SDG&E power purchase agreement and the one-year suspension of the Quail Brush Power Plant. A great big thank you to YOU! Author SandyPosted on August 13, 2013 May 12, 2014 Categories Community, Editorial, Media, Meetings, Mission Trails Regional Park, San Diego, UncategorizedTags environmental protection, Mission Trails, Mission Trails Regional Park, power plant, San Diego3 Comments on Because of You! 1) TUESDAY, December 4, 2012 – Beginning at 3:00 PM This is primarily a closed meeting, but it opens with a brief public comment portion. The CEC invites the public and interested agencies to listen in and participate. If you have a phone number with a direct line (not extension): After you login, a prompt will appear on-screen for you to provide your phone no. In the Number box, type your area code and phone no. and click OK. You will receive a call back on your phone for the audio of the meeting. If you have a phone number with an extension: After you login, a prompt will ask for your phone no. Click “CANCEL.” Instead, call 1-866-469-3239 (toll-free in the U.S. and Canada). When prompted, enter the meeting number above and your unique Attendee ID number which is listed in the top left area of your screen after you login. 2. Reports from Applicant, Staff and Intervenors regarding the status of the Quail Brush Generation Project AFC. Members of the public and other interested persons and entities may speak up to three minutes on a matter appearing on this agenda. 4. Closed Session (if necessary) Committee closed session consideration of the following Item: Deliberation by the Committee on any matters submitted for decision by the Committee including, but not limited to pending motions and scheduling. If you have difficulty joining the meetings, please call the WebEx Technical Support number at 1-866-229-3239. To see if your computer is compatible, visit http://support.webex.com/support/system-requirements.html. Please be aware that the meeting’s WebEx audio and on-screen activity may be recorded. A very magical time at Mission Trails is the Golden Hour – just before sunset. Every one of your senses comes fully alive. The scent of sage, the sound of a hawk’s cry, the feel of a warm breeze, the beautiful scenic views that all come together to create a spiritual experience unsullied by industrial cacophony. Mission Trails has been set aside as Open Space for now and for our future. We who love and frequent Mission Trails believe that East Elliott land parcels adjoining our park should also remain Open Space and not be rezoned to Heavy Industrial. If you feel the same way, send your messages opposing the Quail Brush Power Plant to the San Diego Planning Commission and San Diego City Council Members. Yep, it’s official. The ducks inhabiting Mission Trails Regional Park have weighed in on the matter of the Quail Brush power plant, and they think the idea is WHACK! 1. a social group of any size whose members reside in a specific locality, share government, and often have a commoncultural and historical heritage. The Santee City Council which represents the community living directly downwind of the proposed Quail Brush power plant has already made it plain that they are opposed to the construction of the power plant (in any way, shape or form) by voting unanimously against it, and installing banners opposing it that can be seen WITHIN THE COMMUNITY. I’m sure this bribery of the Mission Trails board is only the beginning of the dirty tricks that Sempra and Cogentrix will be pulling out of their greasy bag during the 60-day continuance that has been granted them to make this power plant idea more palatable to the community. Don’t they get it? There is no price they can pay for the “church” where many of us go to “worship” Nature. That is why we must now redouble our efforts. Don’t just sit back after signing a petition at StopTheSanteePowerPlant. Show up en masse to these Planning Commission meetings. Bring your family. 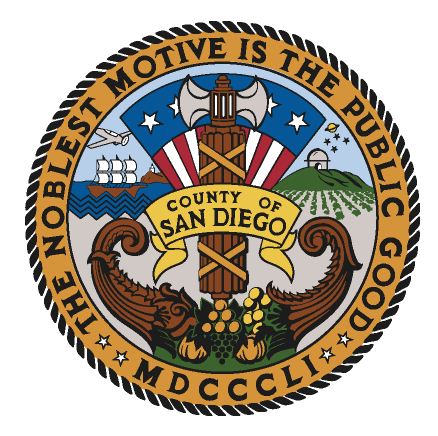 They have shown that they are digging their heels in and our beloved Mission Trails are under siege by monopoly Sempra Energy and North Carolina carpetbagger Cogentrix which appears to have some very large coffers. They have started to sprinkle dollar bills on community groups believing that their money will muffle any opposition.